POMONA – Nearly 300 female students took part in Pomona Unified’s third annual Young Women’s Empowerment Conference last month, learning from professional women who challenged themselves to beat the odds, including Paralympian Sarah Reinertsen, the first female leg amputee to finish the Ironman World Championship. “I want to impress upon you the potential within yourselves to achieve your goals,” Reinersten said during her Jan. 23 morning keynote in which she described how a childhood soccer coach discouraged her from participating in team activities. Hosted at the Village at Indian Hill Conference Center, the event featured 10 healthy mind, body and soul workshops that encouraged eighth-, ninth- and 10th-grade girls to live positive lives, work toward career goals and be themselves. Workshops focused on topics on how to achieve confidence, self-care, avoiding unrealistic body ideals and finding ways to de-stress through writing poetry and practicing yoga. Pomona Peer Resources (PPR), which put on the program, is part of Pomona Unified’s comprehensive approach to peer intervention. PPR works with the District’s middle and high schools to provide more than 20 individual peer intervention programs, which include community-based activities that address the academic, social, emotional and personal needs of PUSD’s adolescents. Afternoon keynote speaker Judge Geanene Yriarte, who graduated from Cal Poly Pomona and was appointed to the bench by Gov. Arnold Schwarzenegger in 2009, also encouraged students to stay on the path to success. She currently serves as a Pomona Juvenile Court judge. 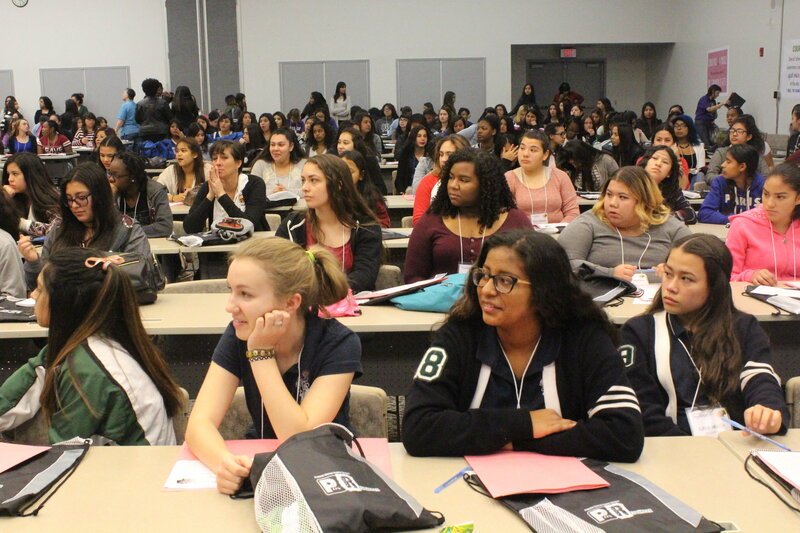 “These influential speakers demonstrate the power all of our female students have within themselves to overcome any personal or academic barriers they may face, whether it’s getting a better test score, finding their first job after they graduate or finding the courage to believe in themselves,” Superintendent Richard Martinez said. EMPOWERMENT1: Students from Fremont Academy pose with their chaperone in front of a flower-decorated wall created for the Young Women’s Empowerment Conference, a Pomona Unified event held Jan. 29 that encourages girls to live positive lives, work toward career goals and be themselves. EMPOWERMENT2: Pomona Unified students pay close attention as they learn about the different workshops offered during the event. More than 300 eighth-, ninth- and 10th graders attended the annual event. 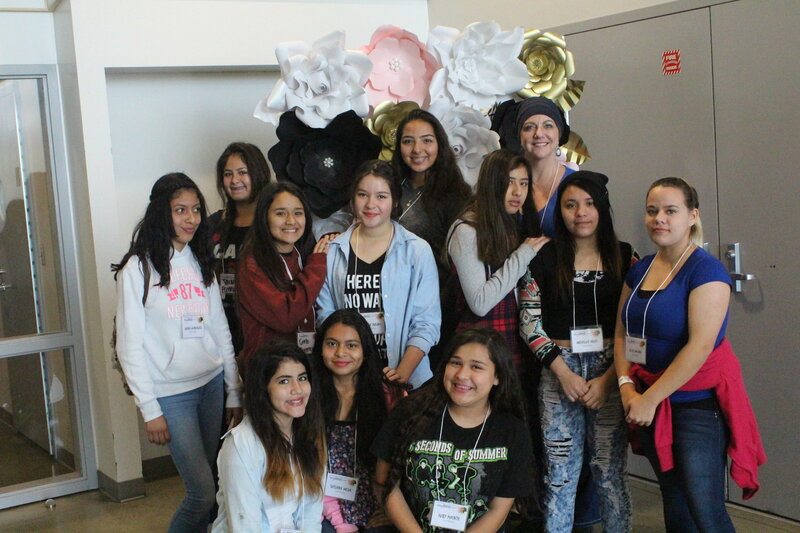 EMPOWERMENT1: Students from Fremont Academy pose with their chaperone in front of a flower-decorated wall created for the Young Women’s Empowerment Conference, a Pomona Unified event held Jan. 29 that encourages girls to live positive lives, work toward career goals and be themselves. EMPOWERMENT2: Pomona Unified students pay close attention as they learn about the different workshops offered during the event. More than 300 eighth-, ninth- and 10th graders attended the annual event.